Summer is the time when you wished you had an Air Conditioner. But, you would rather detest the idea because of the staggering electricity bills you would get once you start using the AC. And it would be a miracle if you could use an AC without paying those hefty electricity bills. In that case, it seems a miracle has just happened! The hottest months usually, happens to be also the sunniest. 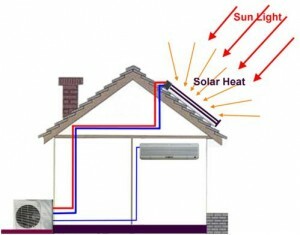 You can use the scorching summer heat to actually remove the heat from your room with the help Photovoltaics (PVs) to power your AC. Photovoltaics are collection of cells which have photovoltaic material that makes use solar radiation to develop direct current electricity. For achieving the best performance the PVs are connected to a solar tracker so as to align themselves towards the sun to receive the maximum amount of solar radiation. The use of a solar tracker would improve the performance of the PVs by whopping 50% in summer. please tell me….what is the cost of project with full details!!!! the idea is so good. Need to more information for solar power air conditioner…..
can u pls guide me in this project? i need a guide to help me right from the basics & i wish to do this! pls help me! I am interested in this project. May you please send me the proper detail of this project. i want details of this project with estimated cost.please send me as early as possible. please provide me all detail regarding the project . recently I have personal interview in ongc & iocl but i am not make any project in my college life that time i need a project.provide me all necessary detail about the project plz help me.